When I was young I remember looking at the pre-Christmas toy advertisements on the TV and wanting the latest Six-Million Dollar Man action figure in the Action Man range, the latest new engineering kit from Mecanno, a Lego castle (or two) and perhaps a chemistry set so I could practice blowing things up. Over the years these tastes have changed with Furby's, Cabbage Patch Dolls and programmable robotics taking the top spots for children's wish lists from Santa Claus. This year though it would seem that Santa's elves might have to seek alternative employment in a Chinese Foxconn factory. 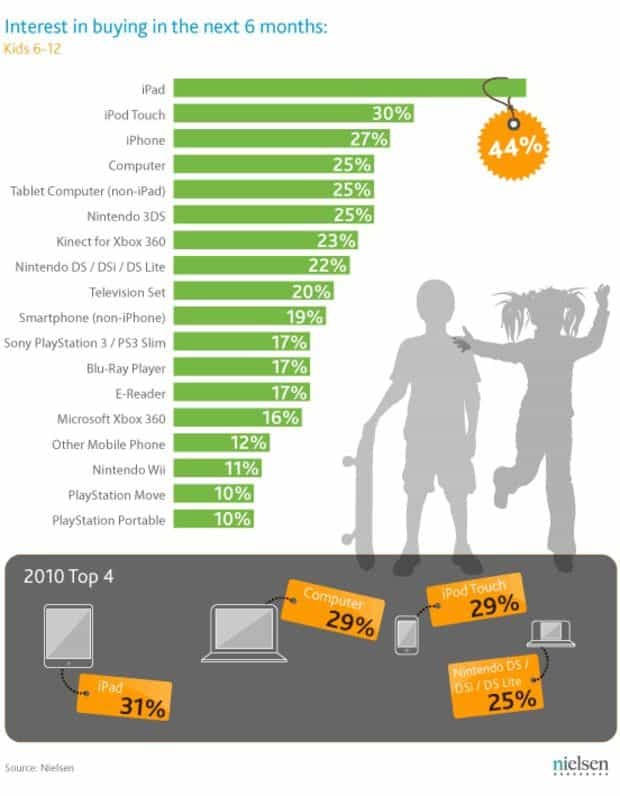 New research released by Nielsen into what electronic devices children want has shown that the top three slots on children's 2011 Christmas wish lists are dominated by Apple. In the research they say that 44% of children aged between 6 and 12 want an iPad, 30% want a iPod Touch and a huge 27% want an iPhone. I say huge as most people would hardly think of a child between the ages of 6 and 12 as the target demographic for a mobile telephone. After this a computer sits in fourth spot and a non-iPad tablet (presumably Android) sits in fifth place. In fact the list is completely dominated by technology that includes games consoles, portable and static, televisions, non-iPhone smartphones, blue-ray players and eBook readers. There can be little doubt that tablets have captivated the minds of the young, because of the new and exciting ways they allow people to interact with the technology, be that zooming in on photographs or flinging birds at pigs. It can also be argued however that the devices offer solitary play opportunities for children and don't encourage them to build interactions with other children in the way that most people consider healthy. The research also shows what children aged 13 and over are interested in buying over the next six months. 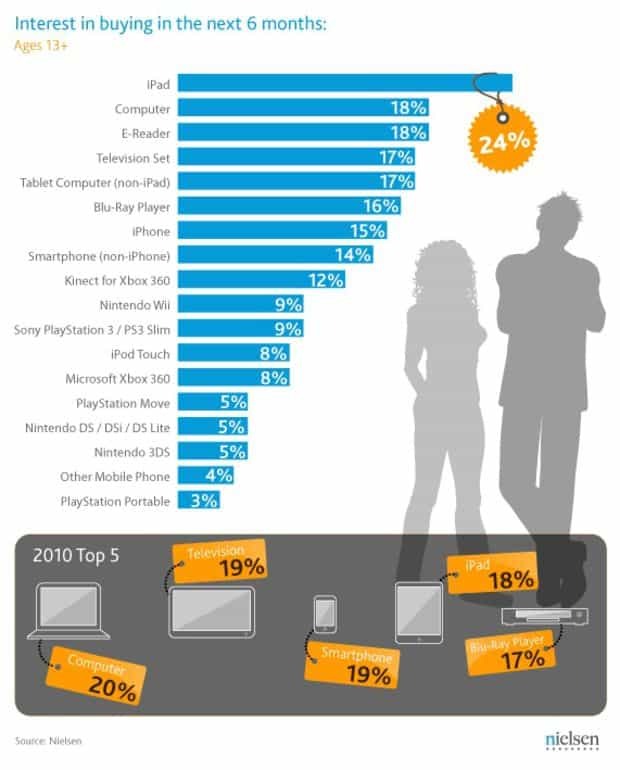 Again the iPad sits as the most desirable item with 24% of the vote and a computer bringing up second place with 18%. Again this list is entirely dominated by technology though it is interesting to note that smartphones of all description, including the iPhone which held the number 3 spot for younger kids, are much further down the list in the teenagers age group with the iPhone sitting in seventh place and other smartphones and non-smartphone mobiles sitting in 8th and 17th place respectively. At the end of the day it is parents who will make the final decisions, so we will no doubt expect stockings to be full of dolls, coloured goo and lego with perhaps a solitary computing or gaming device taking the top gift spot. Children want what children want but this doesn't ever mean that they will get their own way. What have your children asked you for this Christmas? Are you own family experiences a mirror of the Nielsen research or are your children after a bow and arrow set and a colouring book? the reason it’s dominated by consumer electronics is because the survey was specifically about consumer electronics. Yes, right – everybody from young to old likes electronic devices, especially the iOS devices. If Santa Clause was real, then I would have wanted an iPhone 4S. A bit misleading. You say yourself in the article that this is a list of the electronic devices children want for christmas, not a comprehensive list that would include toys and other things. It would be interesting to see where Ipads and Ipods fitted in to kid’s wishlists as a whole though. Count me skeptical of there being any scientific validity to this survey. they could name most devices by brand delineated in the survey. With the exception of the iPad because of its heavy promotion. the biggest selling tablet device competing with the iPad. When between 6 and 16 I personally wanted a book, the rest of the children wanted a Dinkey toy (toy car) or a doll, with Sint-Nicolaas (thatch the same in the Netherlands as Christmastime in the rest of the world presents concerning). When I way IPad/ phone between book/Dinkey toy/doll I still think that the IPad/ phone looses every time and not only because of the money its cost. The IPad/ phone is not a small nice think anymore its bling bling and saying this, i have to say kids have no idea of value anymore. I wonder how many 6 yo kids will get an iPad or iPhone. Probably a lot more than I hope/fear. The days of imagination being children’s most exciting ‘toy’ seem long gone. They, and society in the longer term, are likely to be the poorer for it.